A saggy lower chest makes even the biggest of pecs look underwhelming. Sometimes, a lack of development in the lower region of your pecs indicates that you need to add more muscle to all of your chest, not just this specific region. But, if you know you've been skimping on your low chest development, you're in luck. Certain moves will help you hone in on the lower pecs to add thickness to this low-volume region. Presses and flyes done at a decline are particularly valuable. The lower chest isn't a separate muscle. It's the bottom portion of the wide pectoralis major that spans the entirety of your chest wall. When your goal is to build up this area, start your chest workout with a move that specifically targets it. Then, move on to other chest exercises that address the whole of the chest wall -- including flat bench presses and the pec deck machine -- but ensure you include at least one other lower-chest specific exercise in your chest workout that day. A typical chest-centered workout includes three to five total exercises. Work up to three or four sets of eight to 12 reps using a weight heavy enough to make the last few efforts hard to do with good form. Remember to leave at least 48 hours between chest workouts to give the muscles time to repair and build. If you've been training this way for a while, it might be time to switch things up. Load up heavier weight and make the sets contain just three to six reps. Super-setting is another option. This is where you do two exercises back to back with no rest between them. Then, rest before completing that pair and moving on to another. Consider decline chest presses and incline push-ups as a possible couple, for example. The key to lower chest training is to target the pectoralis major muscle from a different angle. Putting your body in a decline position, with your feet higher than your chest, forces the lower portion of the pectoral muscle to work against more resistance. In the case of push-ups, however, your body needs to be at an incline to target the lower chest. This move takes the classic bench press and flips you upside down. Usually this bench is set at a 15 percent to 30 percent decline, depending on the model. Use a barbell or dumbbells to complete the move. How-To: Lie back on a decline bench. Grasp a barbell from a rack above you or hold dumbbells in each hand, elbows bent to the height of your shoulders. Your hands should be slightly wider than shoulder-distance apart regardless of the type of weight you've chosen. Press up to extend your elbows and lower the weight back down to your chest. This move is valuable because you have more power in your lower chest and can often lift more weight than is possible with a flat or incline press. Decline flyes are known as an isolated movement, as they emphasize just one joint. Your lower chest does most of the work. Do these with dumbbells or a cable machine. Dumbell Flyes How-To: Lie back on a decline bench and plant your feet firmly on the floor. Hold a dumbbell in each hand over your chest, palms facing inward. Bend your elbows slightly and open your arms until you feel a stretch in your chest. Pause and draw the arms back together in a hugging motion. Cable Flyes How-To: Position a decline bench in the center of a cable cross machine. Attach a pulley handle to each cable and bring them down to the lowest level. Lie down on your back on the bench and hold a handle in each hand. Bring the arms together over your abdomen in an arc. Open the arms to return to the start. Subtle changes makes push-ups and chest dips target the lower chest primarily. These are convenient as you don't need any special equipment, or a spotter, to help you. Incline Push-Ups How-To: Place your hands on a surface higher than your feet; a workout bench, step bench or elevated step works. Bend your elbows to push up and down. 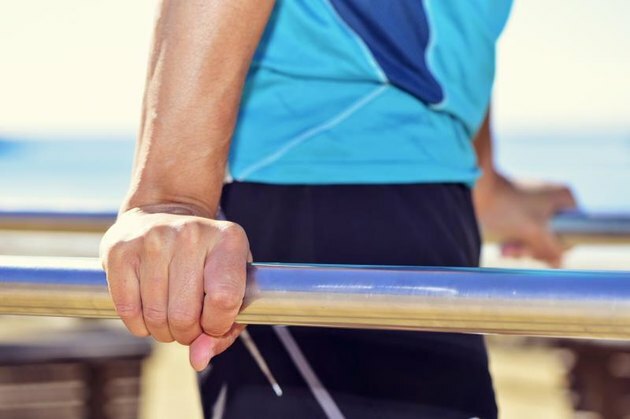 Chest Dips How-To: Mount a set of parallel bars with one hand on each bar and your feet tucked in behind you so you hover. Lean slightly forward as you bend and extend your elbows. Go down far enough to feel a stretch in your chest muscles. For extra challenge during the dip, let a weight plate hang between your legs by strapping it to a chain that you wrap around your waist. Alternatively, clasp a dumbbell between your ankles.